Although I call Colorado home, few places are as inspiring to me artistically as Arizona. 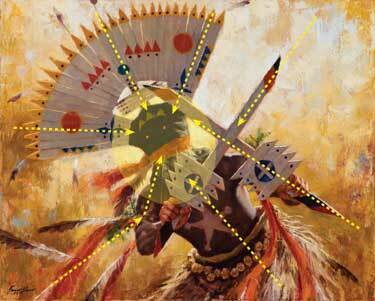 My newest painting, Mountain Spirit, captures the dynamic movements of an Apache Ga'an dancer as he performs. Mountain Spirit is keeping with my theme this year of exploring natural, slice-of-life settings. When designing this piece, my goal was to accentuate the quality of movement inherent in the subject matter. 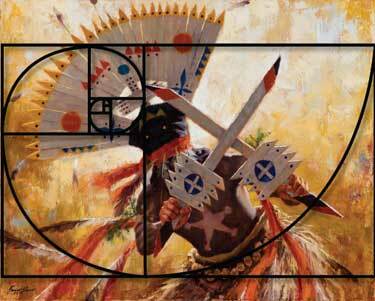 Prior to this work, I had only depicted a Ga'an dancer once before--and that piece showed a full-length view. For Mountain Spirit, I purposely chose to portray the dancer in a horizontal view to force the focus on the mask and hands. See all the angles? I used angles everywhere as well as angular chunks of negative space to draw your eye directly to the mask. The painting is bathed in warm colors; the yellow background is meant to provide the feeling backlighting the dancer with sunshine. Using so much yellow also makes the blue accents POP visually. I also used foreshortening in the arms to give you the perspective of the dancer's hands coming toward you. 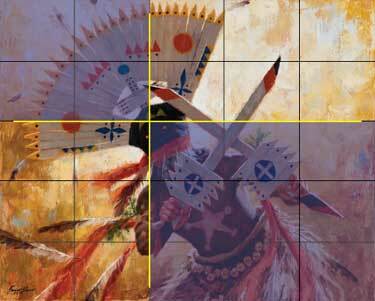 In this picture, I have super-imposed a grid on the painting so that you can see the layout. The mask is perfectly situated at the junction of 2/5 height and 2/5 width. This placement--as opposed to putting the mask in dead center--furthers the active, movement-filled feeling of this composition. 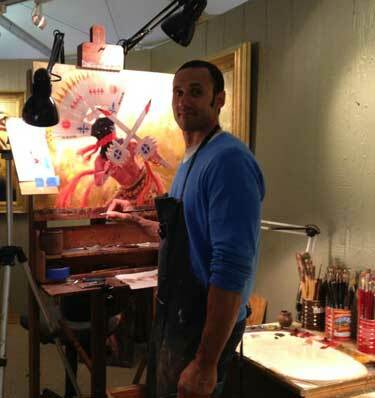 If you enjoy the technical aspects of art, look at the image above. Super-imposed on Mountain Spirit is the so-called "Fibonacci Spiral," which is mathematical construct found extensively in nature and utilized in compositions by Dali, da Vinci, and Mondrian (among others). “The creator sent the Ga’an (Spirit People) to guide the people, teaching them how to walk in the Holy Life Way, to be kind to each other, and to live in harmony with each other and the land. Today’s Apaches still honor those spiritual traditions and crown dancers are called upon to evoke blessings and ward off evil at ceremonies. 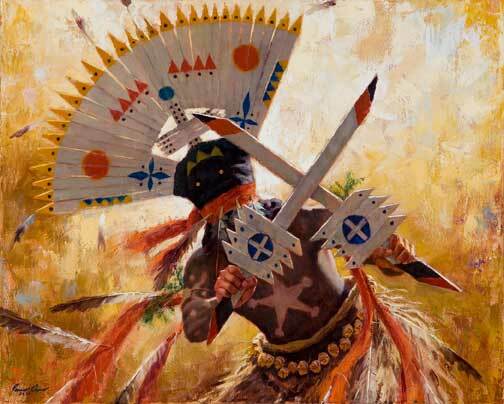 Ga’an dances are performed by men who invoke the mountain spirits. Four dancers representing the four sacred directions paint their bodies black and white and adorn themselves with evocative lightning designs and animal motifs. They are accompanied by a fifth dancer painted gray, an unpredictable clown who acts as a messenger to communicate with the Spirit People. The Ga’an dancers are also instrumental in healing and cleansing ceremonies including preparing the grounds for the coming-of-age ceremony for young Apache girls just coming into womanhood." To purchase, please contact me directly: James Ayers Studios.